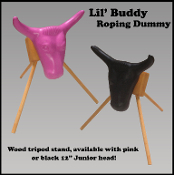 The Lil' Buddy Roping Dummy is a great new roping product for kids. This light weight stand and head weigh about 3 pounds and make a great beginner level training tool and toy. The wood tripod stand is easy to assemble and has a smooth finish with extrerior stain. You can order yours with a 12" horn span junior head in black, or pink. The stand is 13" tall. Includes all hardware and setup instructions.